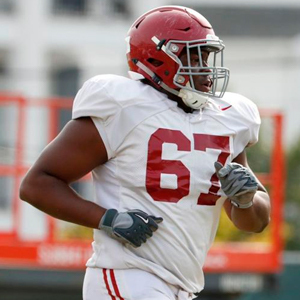 MOBILE, AL – Mobile native Josh Casher has been the starting left guard for Alabama’s football team throughout this year’s spring practices. The St. Paul’s graduate sat out the 2014 season and got his first action as a redshirt freshman in 2015. He started seeing more playing time in his sophomore season, playing in five games, and last season, he played in six games. According to head coach Nick Saban, Casher has overcome his size limitations. The senior offensive lineman is listed at 6-foot-1 and 291 pounds—at least three inches shorter and 20 pounds lighter than the team average—but that hasn’t stopped him from making an impact. During his senior year at St. Paul’s, Casher was ranked the No. 9 player in Alabama by Rivals.com and ESPN. Casher helped lead St. Paul’s to its first Class 5A state championship in seven years. He has also been a part of the two National Championship teams since coming to Alabama. Alabama’s spring game this year is on April 21 at 1 p.m. and the regular season kicks off Sept. 1 when the Tide takes on Louisville in Orlando. View the interview with Casher by clicking HERE or read more HERE.